Those are the top old second-base performances since 1956. Expand the list further back in time and you find that the only other second basemen to record higher WAR totals than Kinsler in their age-34 season or later are Hall of Famers Eddie Collins, Charlie Gehringer, and Nap Lajoie (who did it twice). When the Tigers traded Prince Fielder to the Rangers for Kinsler after the 2013 season, it looked at the time like a swap of two declining players on long-term contracts. Unfortunately, that was very much the reality for Fielder, whose playing career ended this summer due to injuries. But Kinsler? He has thrived in Detroit. Although he’s been an above-average contributor with the bat ever since the trade, much of his value has come from his glove. This year, however, he broke out offensively with a .288/.348/.484 slash line and 28 home runs. Overall, he posted a 123 wRC+, which is tied with 2011 for the second-highest mark of his career. 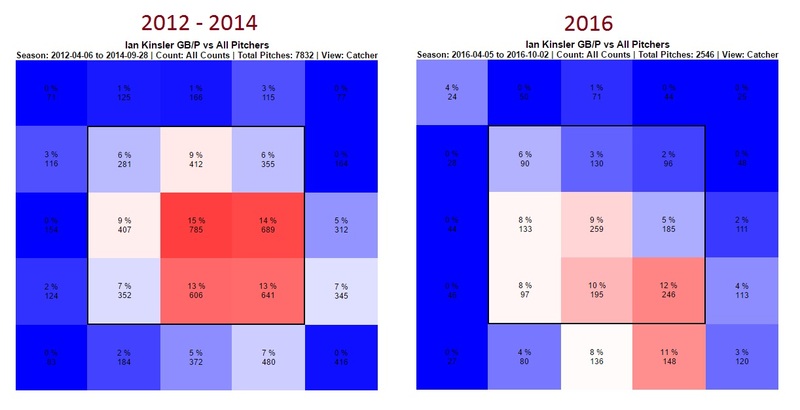 But the most significant change for Kinsler this season was his power. Home-run rates soared across the league in 2016, so he isn’t particularly unique in this distinction. However, the league’s rate of homers per fly ball (HR/FB) made a 12% increase from 11.4% a year ago to 12.8% this past summer. Kinsler, on the other hand, saw a 150%(!) increase in his HR/FB rate from 5.0% in 2015 to a nearly league-average 12.5% this year. Clearly, his personal improvements in this department far exceeded the league’s collective improvement. The result was as many homers in 2016 (28) as he hit in his first two seasons with the Tigers combined (17 in 2014 and 11 in 2015). There is an important caveat which accompanies the improvement in power: of the 60 players with 25 or more homers recorded by Statcast this season, Ian Kinsler’s average home-run distance doesn’t just rank near the bottom; it comes in dead last, at 381 feet. Kinsler’s average home-run distance in 2015? Also 381 feet. Overall, he did see an uptick in exit velocity from last year to this year (86.2 mph to 87.5 mph), but his 87.5 mph exit velocity was still tied for the 125th lowest among the 150 batters this season with a minimum of 300 batted-ball events. 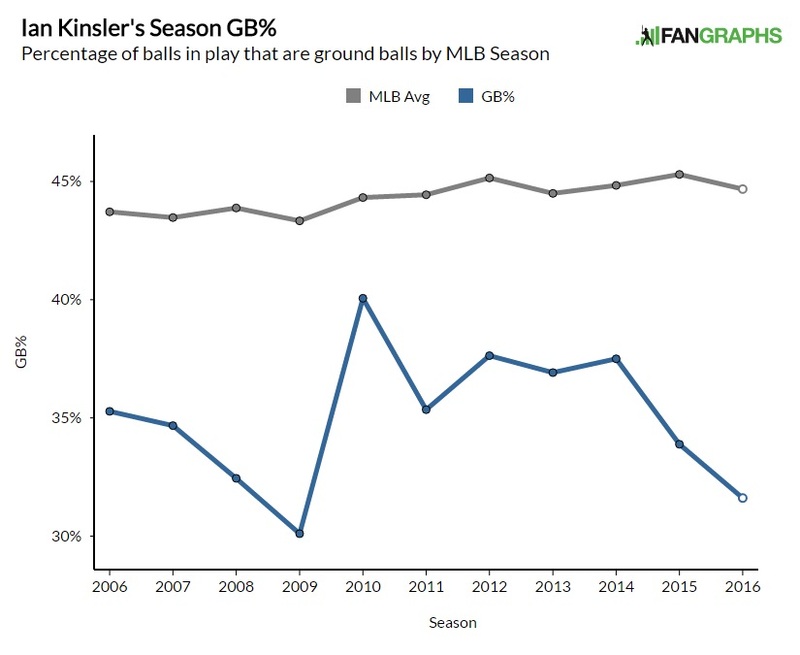 This makes it easy to imagine Kinsler will struggle to replicate his power surge next season. Additionally, he posted the highest strikeout rate of his career and lowest contact rate since his rookie season. Swapping contact for power is great when it works, but the increased lack of contact may become conspicuous if it’s not accompanied by a similarly extreme a power surge next season. Despite that one note of caution, nothing can take away from Kinsler’s tremendous performance this season. After missing the playoffs for the second straight year, the Tigers will look to find a way to put themselves in position to win again and soon. The fact that Kinsler is only under contract for one more season — with an additional team option for 2018 — could make him an intriguing trade chip this winter. Given the unlikelihood that Kinsler will improve further during his age-35 season, his trade value may never be higher than it is right now and the Tigers may find a trade return that can help them beyond 2018. Under contract for just $11 million next year, Kinsler could be an excellent fit for a team in win-now mode with a current weakness at second base such as the Dodgers, Cardinals — or, depending on the direction they take this winter, the White Sox. We hoped you liked reading Ian Kinsler’s Historically Great Season at Second Base by Corinne Landrey! Does he pull the ball in the air more than normal? 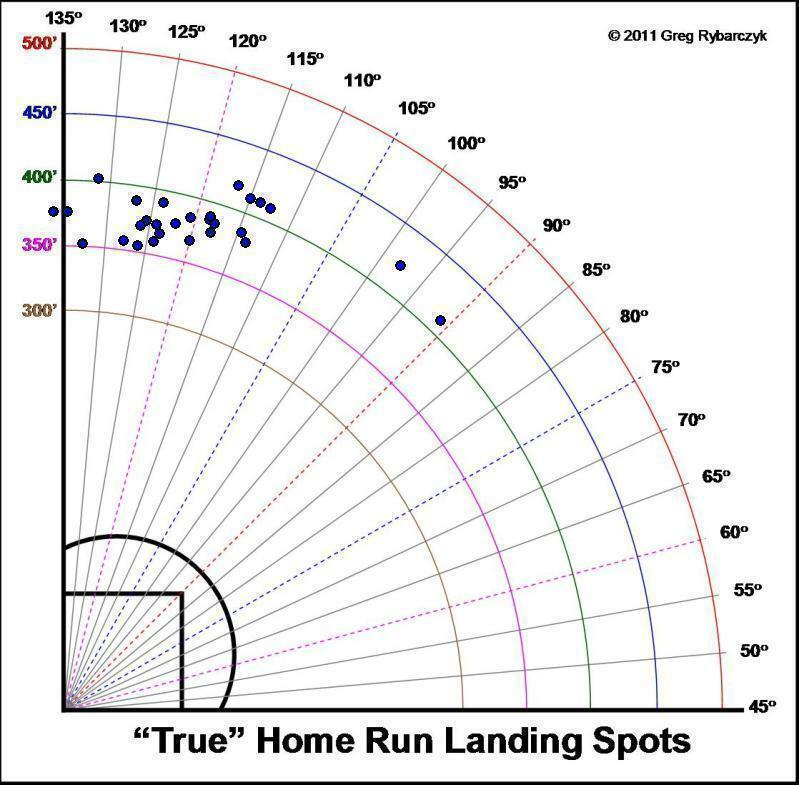 That would explain how he gets home runs with less distance since the fence is closer down the line than to center. He is an extreme pull hitter on fly balls. In fact, Baseball-Reference says he has hit 11 home runs to center or right field – in his entire career.